To prepare for the outing, I purchased more chemicals from Freestyle. I was out of Xtol and needed new Diafine. I also picked up some additional bottles for chemicals and some new film canisters to replace the metal ones I have that are showing some signs of light leakage. I also ordered an E6 nd C41 kit to try out. Pentax K10D (digital) which I didn't use! I was loaded down pretty heavily, with a camera bag, the tripod, and camelback for water and supplies. Mika dropped me off in the morning and I met the PACC club at the garden, after I stopped at the memorial monument. By the time I got there, the group was already in full swing, Philippe was lecturing about lighting and composure and what kind of exposure would work well. The remnants of the marine layer continued to provide soft light, allowing easy exposures and filling the shadows well. Later, these clouds lifted and the soft light changed to hard light. I'd made the mistake of not checking the battery in my light meter the night before, so I had to borrow an AA battery from a PACC member. Thanks a bunch! Dan Wright came to the event as well, since it gave him the chance to ride his bike to campus and go on a long photo walk with a variety of people. Good to have an outing with him and I enjoy his company. Once the clouds changed and the light gave way to the bright sunlight, I quickly finished off the rolls of TriX that were to be developed in Diafine and switched to new ones for use in Xtol. The PACC reconvened at 11:30 AM to chat about people's impressions of the activity and to go our separate ways. Dan and I decided that we'd go to the Powwow next after a detour by the mausoleum. The vertical lines of the tomb were perfect for the shift lens and the fisheye rendered the scene in a more imposing manner. I want to get back to this target again. Approaching the Powwow, the drumming and singing was reaching a peak with the presentation of the gourd dancers. We missed this scene, but there was more to come. Dan and I ate lunch at the Powwow, having the basic frybread. Good stuff. When we made it back to the dancing arena, the crowd was thick around the railing. Dan had to stand on the top of the bleachers to get a clear shot. Unfortunately, I was not feeling comfortable enough to climb up to the same vantage point, so I handed cameras to him so that he could get the shot. When we went around to the other side of the arena, we could see the view from the judges' stand, which made for better shots. This is where the 200mm lens came in handy - we could stand behind everyone and shoot through the gaps in the crowd. We met some good people, many saw us lugging around camera gear and started talking about how they used to shoot film in the "old days." One fellow told us a story about how he recently had some film developed from a firefight in Vietnam. Interesting stuff! We walked on from the Powwow to get to the sculpture garden. As the sounds of the drums faded in the distance, the quiet of the campus gave way to the normal chatter of students coming and going as we neared the main quad and passed some dorms. We stumbled upon the "Gay Liberation" outdoor sculpture and paused to take some pictures. Again, the fisheye rendered the scene with a different view. Finally, we reached the New Guinea sculpture garden. What a great find! The shift lens really shines with these tall figures. They remind me of totem poles. Of course, the fisheye worked on the shorter ones, too. A few days later, I finally got some of the film developed. I wanted to mix up the Xtol first, then make a new batch of Diafine. 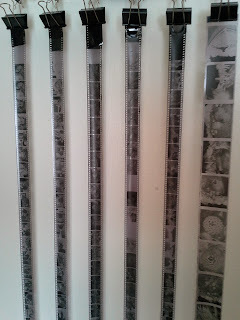 It's taken nearly a week to do all the black and white film, but it's now complete! Next step is to mix up the C41 - assuming that I have the bottles to do it! I'm expecting that when I see Casey, I'll swap 4 bottles of Diafine and take two glass bottles from him. Once I get those, I can develop the color film I have waiting. Lastly, I was annoyed with how the 120 format TriX was so stiff and didn't want to go onto the Patterson ratcheting reel. I opted to put it on the stainless steel reel. Such a smooth experience! I don't know why the plastic reels don't like the 120 format. So long as I have a solution that works! 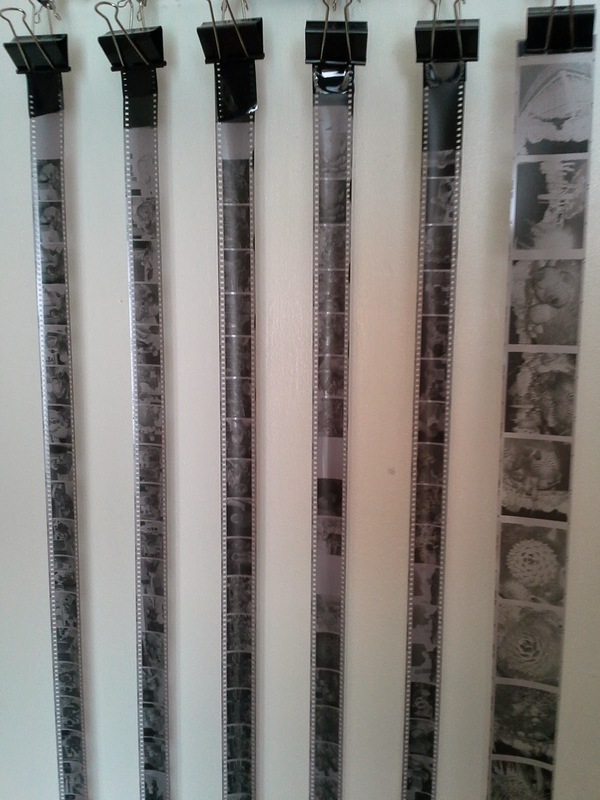 In the end, I think I'm going to switch to the metal reels for most of the developing work. The film is currently drying, I'll press it for a day or so, then get it into the computer. I'm hoping to have a print or two ready for the PACC critique night on Wednesday!